The Hamilton Southeastern Education Association (HSEA) held a forum tonight for the candidates running for school board. I was honored to be invited to this forum to get to talk to a number of teachers, community leaders, parents, students, and others. The event was video taped and should be made available to the public in the near future. When it becomes available, I’ll post a link. The forum was an interesting process, that was different from anything I’ve done in quite a while. In this event, each candidate was asked the same question and given 60 seconds to answer. The questions that were asked, came from the audience, so there was an interesting set of topics. There were several issues that weren’t brought up that I expected to hear, and there were a few questions asked that were new to me. Providing answer to these serious questions in 60 seconds is tough. With such a little amount of time, the attempt was to focus on the core elements and hope that people understand the context for the answer. I found that after most of my responses, I had a number of additional things I would have liked to have included. Because the forum didn’t allow time, I’ll work to comment on some of those topics here on my blog over the next few weeks and months. There were good questions that deserved deeper responses. In the meantime, below is a summary of information I’ve put into a handout that you can download from here. This is also sparse in that I tried to get information about myself along with some of the core issues that have been raised for the board. This information was created to fit on a single, two-sided piece of paper that I’ll be handing out. If you live within the HSE district, please feel free to download the document and share it with your neighbors. I’d like your vote on November 8th for a position on the Hamilton Southeastern School Board. Whether you have children in the public schools or not, the HSE School Board is making decisions that impact you and impact your child’s future. Even if you don’t have kids in the schools, the passing of bonds and referendums impact your taxes, and the quality of our schools impacts the success of our city to draw new businesses and families into Fishers. There are a lot of issues and topics that the HSE School board is or needs to address. I’ve listed just a few on the back. I am a dad of two attending HSE Schools. I am a regular volunteer at the schools, as is my wife. I prefer to solve issues rather than just talk. I am proactive. I also am not afraid to go to the source to get answers firsthand. I grasp the details needed to get things done and don’t just buy into the hype. Prior to deciding to run for the board, I regularly attended HSE School Board meetings so I could be informed. Edit: I’m the only candidate other than the incumbents that was regularly attending the school board meetings prior to putting my name on the ballot. Over the past two years, I was often the only parent in the audience for the main portion of the board meetings. I didn’t wait until an election to get involved. I’ve been a room parent for the past six years. I’ve been told I execute a good class party, and teachers have complimented the learning aspects of some of the games played. I’m actively involved in our community in driving technology education through user groups and meetups. I co-founded and ran the Indianapolis Developers Association for over a decade growing membership to over 3,500 at its peak. I’ve been recognized as a technology influencer by companies like Microsoft. I’ve written technical books that teach people of all ages how to program computers. My internationally bestselling books take technical topics and make them easy to understand. I interact daily with a diverse group of people from around the world through my job. I have experience with personnel issues, contracts, project planning, technology, and more. School Board positions are non-partisan positions that will appear on the November 8th ballot. It’s not about political parties; it’s about the students. There are three of seven school board positions up for election this year. You’ll be able to vote for one candidate in each of the three townships within HSE. I’d like to ask that you vote for me to represent Delaware Township and then vote for one other person in each of Fall Creek and Wayne Townships. While we are aligned with a township, our decisions impact every student and family in our entire district. Ultimately, it is all about the kids. Overall, we have great schools, wonderful teachers, and fantastic kids. Even so, we can continue to improve. Regardless of the area of focus or the topic, the core to any decision is the students. The following are a few kid-centric initiatives I expect the board will be talking about (or that I will be raising). Clarifications: *The 2% growth projected for the City of Fishers over each of the next 10 years would equate to 300 to 400 kids added each year, thus needing 10 to 15 more classrooms. **Allowing out of district kids to go to HSE schools could take sport and academic positions away from in-district kids. Our teachers and teaching policies are the core to our success. We need to support the success of our teachers and programs. accountable to our community. 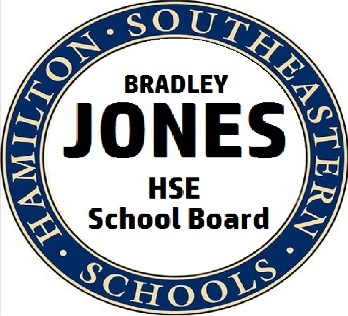 Help by voting for Bradley Jones for the HSE School Board on November 8th. As already mentioned, the above are abbreviated lists made to fit on a handout. If you have questions on my positions on any of the above, feel free to ask. Ultimately, it is the group of seven board members that will determine how each is addressed.